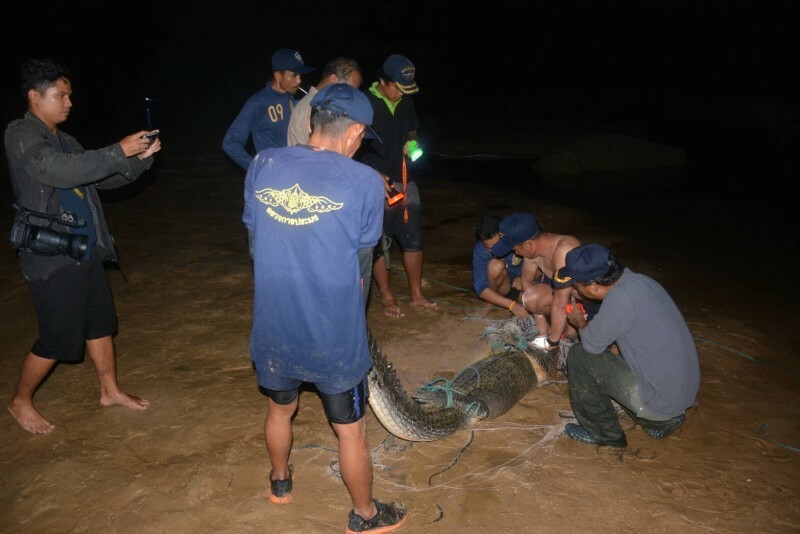 PHUKET: The crocodile that has eluded capture for the past 11 days since it was spotted off Yanui Beach in Rawai was caught early this morning near the rocks off Koh Kata, just offshore from Layan Beach. 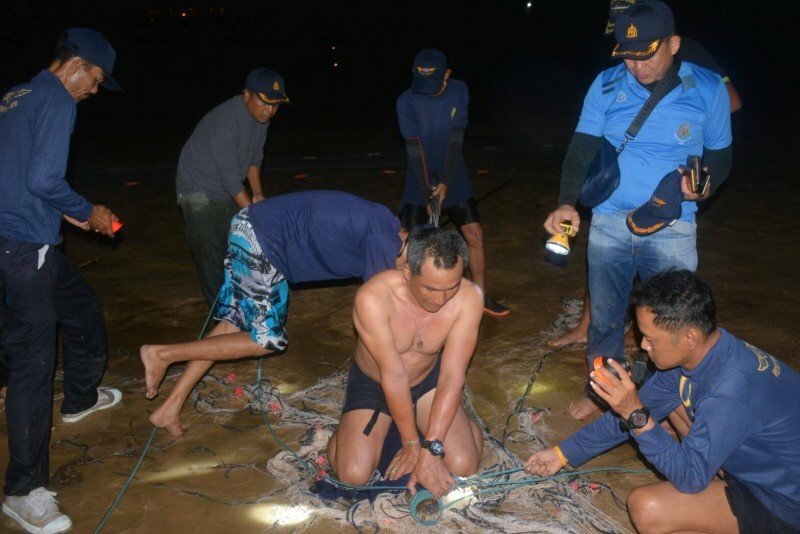 The crocodile was snared in nets by the ‘Kraithong Lumnamtapi’ team of experts from the Department of Fisheries in Surat Thani, brought to Phuket especially to catch the reptile, at about 5:30am. The crocodile, a female, measured about 2.3 metres long and weighted about 150 kilograms. She will be taken to the marine life research centre at Baan Laem Sai in Mai Khao, Thalang. The crocodile was first spotted at about 4am, leading to the chase, Phuket Governor Norraphat Plodthong explained at a press conference this morning. 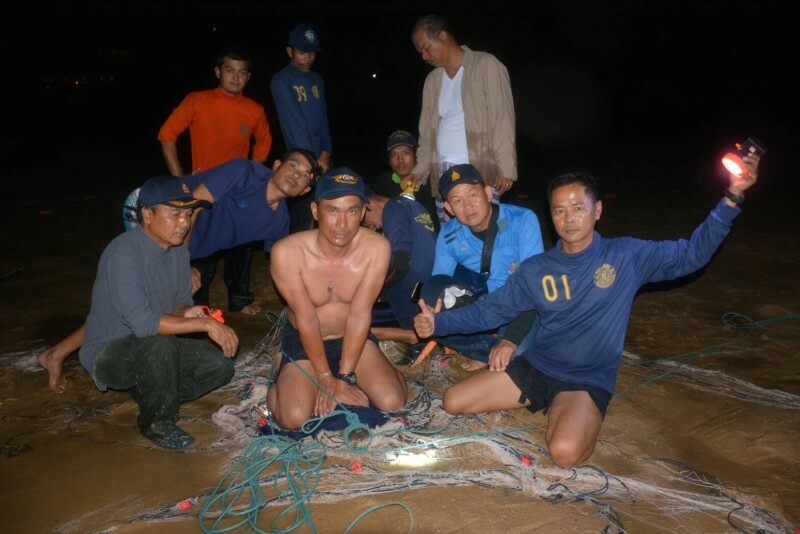 The search teams also comprised municipality officials, local rescue units and local fishermen, but it was the Kraithong team that finally chased the croc to near the rocks off Koh Kata, where they snared it in a double-layered net. 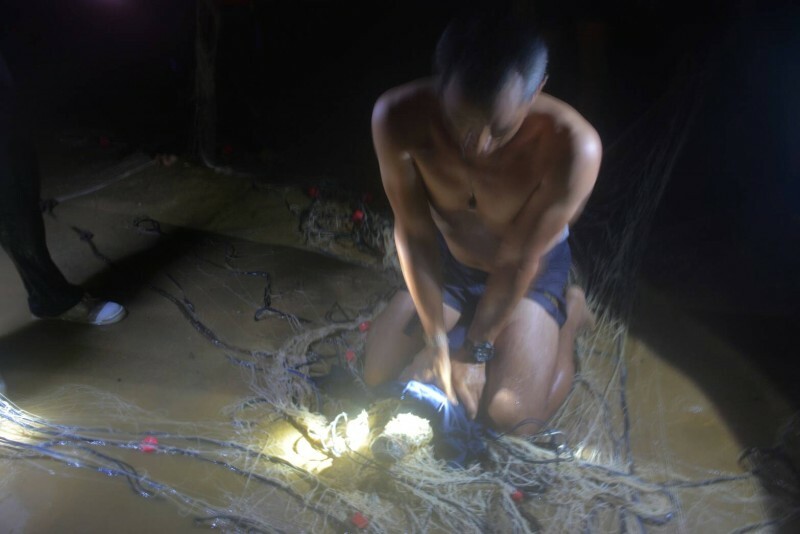 After the croc had become tangled in the net, the team took about 15 minutes to have it under control, he said. The crocodile has been taken to the Coastal Aquaculture Research and Development Center Region 5 (Phuket) centre in Mai Khao. Officials will conduct a DNA test to determine the exact species of crocodile, Gov Norraphat said. Fisheries officials will continue their investigations in the hope of determining where the crocodile was trying to go, the Governor added. Fisheries Dept officials also have been ordered to scour the island for any rogue crocodiles still in the wild. Of note, the mixed-breed crocodile “Leypang”was caught in the same area as today – at Leypang Beach, right next to Layan and Bang Tao Beaches – in September last year. Leypang is now kept at Phuket Zoo. 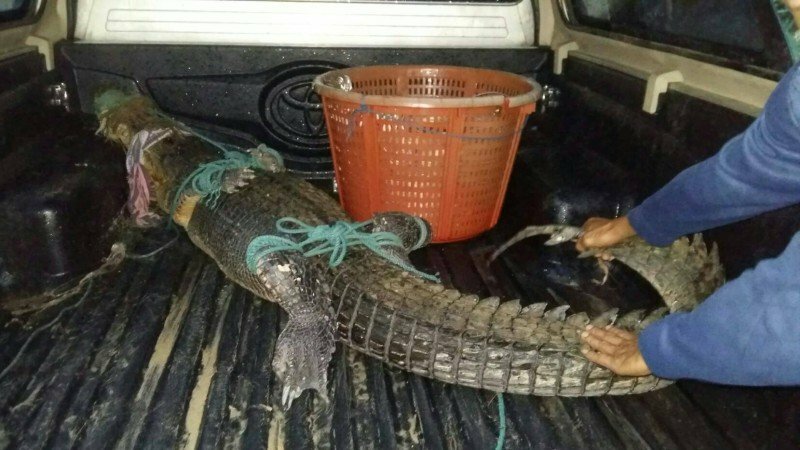 The crocodile caught today has not been microchipped, Gov Norraphat confirmed, but added that officials still believe that the crocodile had escaped captivity from a person who was keeping it illegally and had not notified authorities. There are currently only five entities registered to keep crocodiles in captivity on the island, one zoo and five crocodile shows, he said. People have been given until Aug 10 to register any crocodiles they may be keeping. After that deadline, any persons found keeping crocodiles in captivity illegally will face the law, Gov Norraphat warned. Village chiefs and local residents have been asked to report any unusual areas or pens that villagers may have, and for any persons regularly buying unusual amounts of raw food for such animals, such as chickens. Rewards will be offered to people who give information that lead to arrests, he said. Any persons found illegally keeping crocodiles in captivity face a fine of up to B10,000 or up to one year in jail, Gov Norraphat warned. They can't figure out why road deaths are so high, how the heck are they gonna figure out what a croc is gonna do? More dumb talk from dumb officials unable to resolve anything, though that's not limited to Thailand, that's most politicians and government officials in general! Ben... thanks for the laugh. I love this..."Fisheries officials will continue their investigations in the hope of determining where the crocodile was trying to go." What are they going to do?..interrogate it...burn it with cigarettes until it talks? Do they think it had some kind of itinerary, like it heard of a great place to go from other crocs? I'd say north Layan would be a great place for a croc.